Dress up your summer table, whether it’s indoors or out, with new placemats. 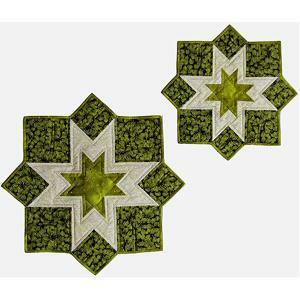 Triplet Placemats and Table Topper look pretty, and summery in green. Change the colors (blue for the center star, and red for the outer areas and you have a perfect setting for the 4th of July! They’ll look so festive that they’ll be a popular item for summer parties. 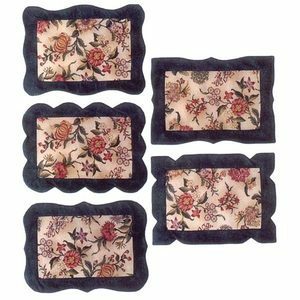 A Handful of Fancy Placemats allows you to use that pretty fabric that you’ve hesitated to cut thus far. The fabric takes center stage, and you select from five different edge designs to frame it. 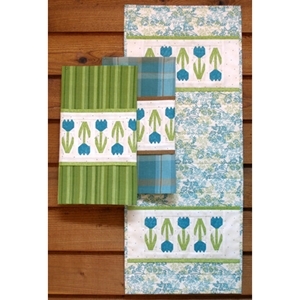 Fussy cut centers can personalize and set the mood for the Three Step Table Runner and Placemats. Just three easy steps to finish and they are ready to use! The Sun’s Up! 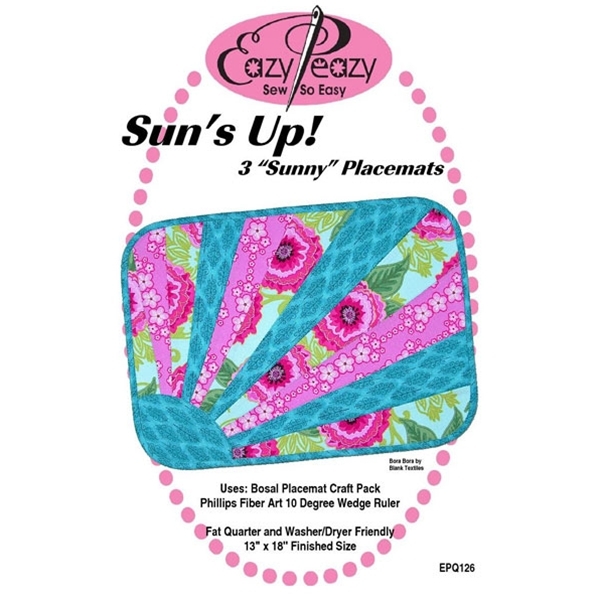 pattern from Eazy Peazy has three different layouts for the sun and its rays. High contrast fabrics make a splashy, sunny placemat. This might be a fun pattern on which to try gradated fabrics. Three options for 13″ x 17″ placements so you can make them As You Like It! Directional prints would be perfect with these layouts. Looking for summer-y prints for your summer placemats? 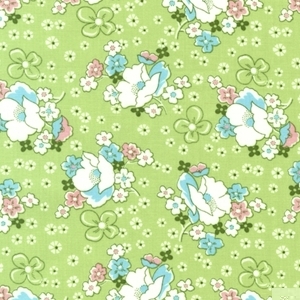 Try the Aunt Grace Fabrics which contains lots of bright 30′s style prints. And, of course, florals always work for summer patterns. Start sewing and you’ll be dining on your homemade goodness before you know it! Spring is going to be here one day. Though it’s the shortest month, February always seems so loooooong. Makes me feel like Spring can never come! But it will! It does every year – so I’m counting on it! In the meantime making a Spring table runner just might make the time pass more quickly. Busy hands, and all that. 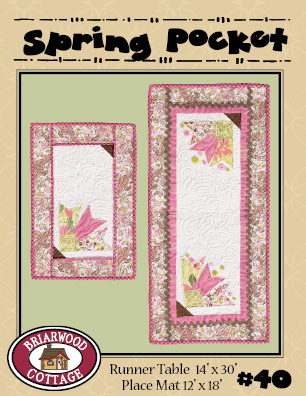 Briarwood Cottage’s Spring Pocket Table Runner has beautiful, delicate looking applique in the corners, leaving the center open to showcase your quilting. The table runner measures 14″ x 30″. The pocket pattern (just $5!) 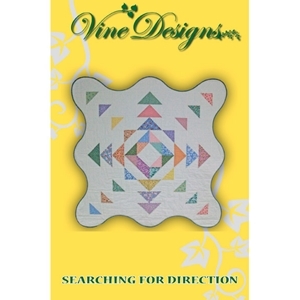 includes instructions for matching placemats. What a fresh looking design! Searching for Direction can be made with normal square edges. 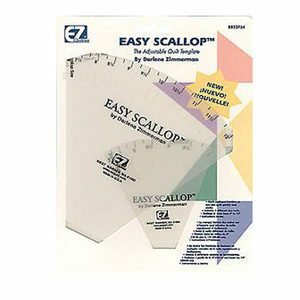 Or use the Easy Scallop tool for the scallop edges and add a new technique to your arsenal of talents! 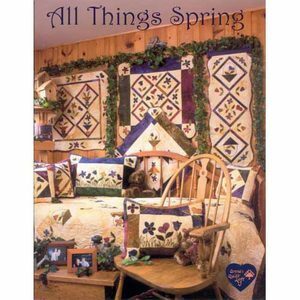 All Things Spring is just packed with projects in a Spring theme. Many of the projects have instructions for multiple sizes. 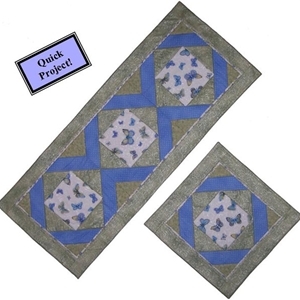 Enjoy piecing and applique as you make wall quilts, table runners, placemats, table toppers and more. This cute Spring Pickins’ table runner by MH Designs features paper pieced tulips. Never tried paper piecing? What are you waiting for?! You might just love the technique. It give you ‘perfect’ results! And if you do fall in love with paper piecing, Mary Herschleb has several dozen beautiful patterns, all constructed with paper piecing. Bonus tea towel instructions are included in this pattern. Spring is on the way . . . . get your table runners ready! Beverage Mats, Coasters, Mug Rugs . . . .
Lots of names for these cute little quilty pieces of art, but they’ll all hold your beverage. Some of them are big enough for a bit of a snack, too! Modern, trendy coffee cups make great hot pads and cup matts. Be part of the Coffee Club! 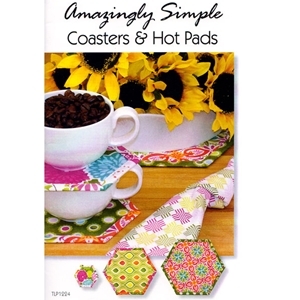 Amazingly Simple Coasters & Hot Pads use the backing fabric as an accent – no binding! 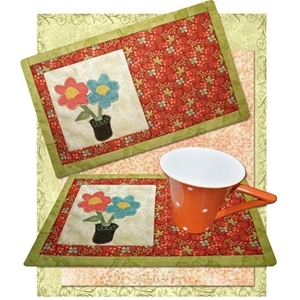 From Tiger Lily Press, this pattern comes with instructions for a large hot pad, a small hot pad, and coasters. Spring Blooms beverage mat is number five in a series of 12 mats from 2 Easy Designs – one for each month, all with applique appropriate for the month. They measure 6″ x 10″ - perfect for a drink and a snack. 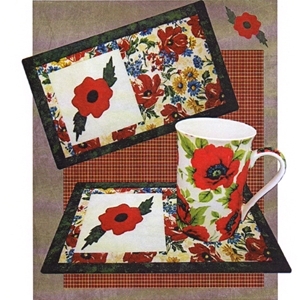 Remember is another beverage mat from 2 Easy Designs. One simple red flower is just the right touch! 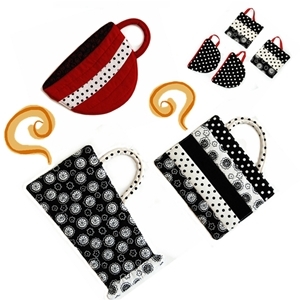 Any of these “mug rugs” would make great hostess gifts, or would serve to make your breaks a little more special, while keeping your desk clean. Have fun making them (and using up your scraps when you do) and then have fun using them or gifting them! Don’t you just love the look of a table all dressed up for a meal? Family supper, kid’s birthday party, casual brunch, formal dinner, romantic meal…. the table dressing sets the stage. Any Occassion Tablerunner & Placemats would look great at a Sunday brunch, or tea time with friends. Choose your color scheme but this green and pink looks really pretty. The center blocks are great for showing off your favorite large scale prints. What little boy or girl wouldn’t love to have these Cupcake Party placemats at their birthday party? Or use them anytime to make a dinner special. Pattern includes full-sized pattern pieces. Easy Elegance from Designs To Share With You uses a quilt-as-you-go method for curves so you’ll be dining in style before you know it. Perfect for a dinner party, or just for making your family’s evening meal a little more civilized. Frosty Table Toppers will work all winter long. The Tablerunner includes snowmen, pine trees and stars. 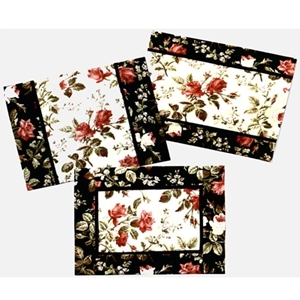 Use any of these designs to make your placemats to match. Go as bold as you dare with Rainbow Crystals. So easy to make – just stack, slice, and mix. No paper piecing and no templates. Grab your colorful solids, tone-on-tone, or batiks and make a set for yourself. You’ll probably find the process so quick and fun you’ll have to make more to give away. The Rosey Posey pattern is lovely. Tablerunner and placemats feature appliqued flowers, leaves, and vines that are accented with delicate stitchery. A stitchery pillow pattern is also included. Browse the rest of the placemat patterns and start dressing your tables! Make a few useful items for your kitchen and brighten it up at the same time. While you are sewing you could make a few extra and you’ll have hostess gifts on hand ready for when you need them. Are they oven mitts or are they potholders? They’re both! They’re Pot Handlers. So easy to make and with so many opportunities to embellish and personalize you’ll get hooked on sewing these up. You won’t be hiding these in your kitchen drawer…. you can make them so cute you’ll be hanging them out in the open to show them off and brighten your kitchen. Add a splash of color to your countertop with a bowl full of Hot Fingers. At 8″ x 4″ these are just right for quick little hot jobs… opening the popcorn bag, lifting a pot lid to give that stew a stir. I know. Too hot for stew right now. But it won’t be long and we’ll be lamenting the passing of summer, welcoming fall, and longing for a steaming plate of beef stew! Embellish these to match your Pot Handlers. Or add a small bit of applique. The Grocery Sack Sleeve Pattern turns that unsightly mess of grocery bags that you recycle into a cute column of color. It keeps those bags handy and easy to grab. So much prettier. You know that kitchen towel that you have hanging around? Not the one that’s on the counter getting wet, but the one that hangs out pretending to be useful but you don’t really want to use it and mess it up ’cause it’s pretty? Make a few extra pretty ones and then you can actually use it occasionally! Prairie Point Kitchen Towels take ordinary towels and promote them to pretty. 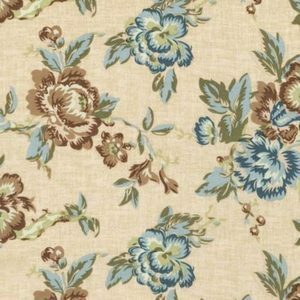 Browse this page of Kitchen Patterns and you’ll see a few appropriate kitchen fabrics too!